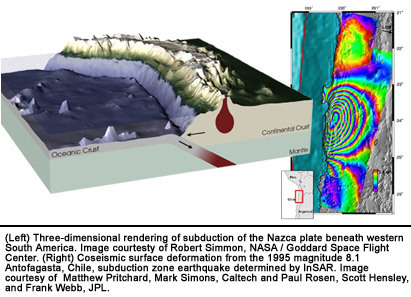 The goal of the surface deformation observational strategy is to measure spatially continuous displacements of the Earth's surface on both temporally and globally comprehensive bases. Repeat observations must resolve rapid deformational processes such as earthquakes, volcanic eruptions, glacial flow, and regions of devastated infrastructure due to fires and earthquakes in urban areas. The ability to map quickly these regions of devastation will substantially improve capabilities for rapid emergency response to these destructive forces. It is important as well to measure slow deformational processes such as interseismic strain accumulation, magma chamber pressurization, surface displacements from migration of crustal fluids (e.g., water and oil), and motions of the ice sheets. Modeling to date indicates that accuracies of 1 mm/yr over 50-km horizontal scales are needed. Such a capability will permit an assessment of how slow transient events (e.g., modest strains over large areas) relate to earthquakes, distinguishing between strain accumulation on a single fault from strain on multiple faults, and accurate determination of the nucleation of earthquakes and the effects of fault asperities on earthquake slip. Immediate (1–5 years): A single dedicated InSAR satellite operating at L-band, with left/right-looking capability and weekly access to anywhere on the globe. Such a mission should include precise orbit determination and ionospheric correction capabilities. This mission should achieve accuracies of 1 mm/yr surface displacement over 50 km horizontal extents in selected areas. Displacement maps should cover 100-km-wide swaths. Near Term (5–10 years): A constellation of InSAR satellites capable of producing deformation maps at nearly daily intervals. Maps should extend several hundred kilometers in swath width and provide full vector surface displacements at accuracies of submillimeter per year over 100-km spatial extents and 1-m spatial resolution. Long term (10–25 years): Hourly global access from a constellation of InSAR satellites in low Earth or geosynchronous orbits. There should be an increase in the density of continuous ground and seafloor geodetic observations.